Guys. Guys. It’s not summer anymore! I need gloves and a hat for my bike ride to work! It’s a miracle! And very convenient because I happened across this soup recipe and it sounded so delightful I made it the next day. I would have made it that same day but I had a Halloween party to attend. 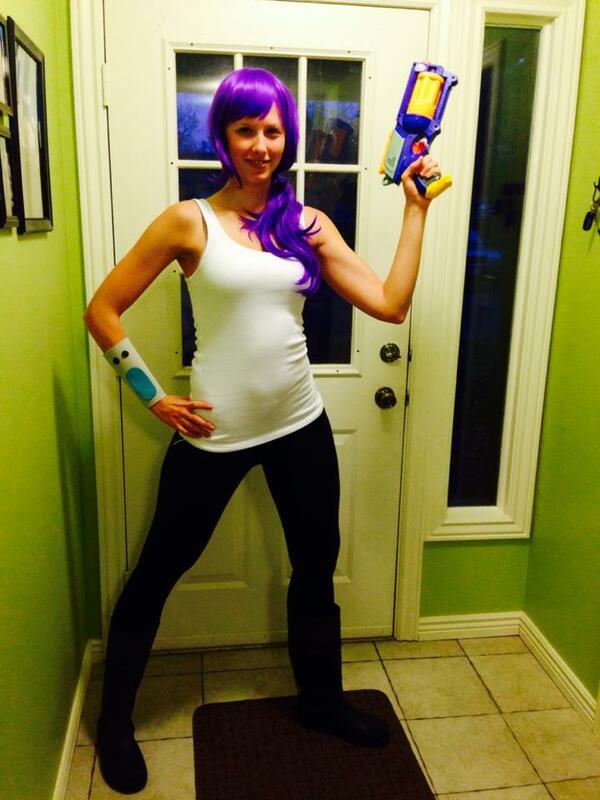 I went as two-eyed Leela from Futurama this year. Aaaand it’s winter. I wrote this last week and then left for my 6th and final half marathon of the year in Nevada. I got back last night and this morning I woke up to snow. A far cry from the 84 degrees at the finish line. But I got first in my age group! First time ever placing, so that’s fun. In any case, soup. 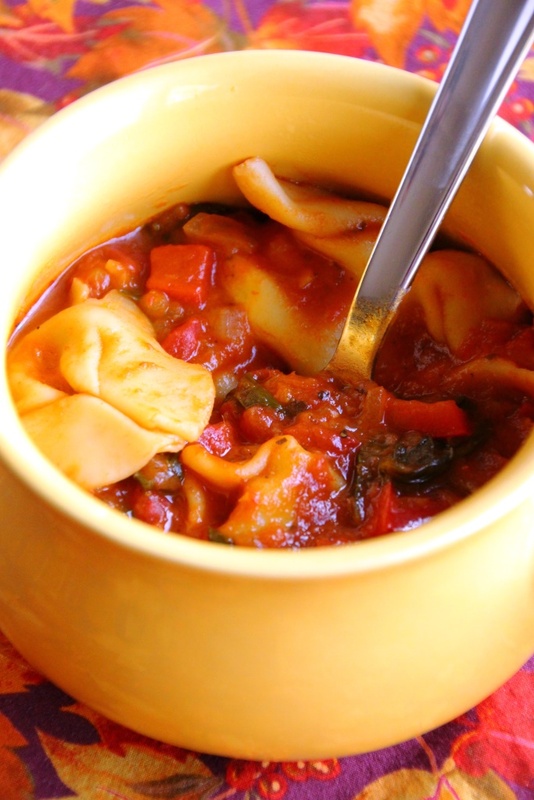 This one has a chunky tomato base with a hearty dose of tortellini and spinach to switch it up a bit from your average tomato soup recipe. Don’t get me wrong, Pacific Food Roasted Red Pepper & Tomato soup with a side of grilled cheese is one of my go to meals any time of year, but it’s nice to have a homemade option to add to the mix. 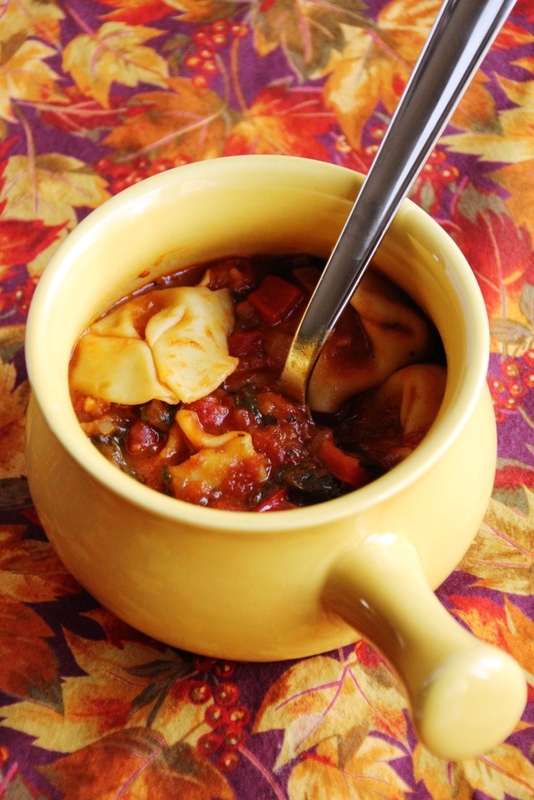 Even better, this soup has great flavor, is very filling, and is easy to make vegetarian so long as you pick a package of tortellini without meat. Spaghetti sauce is a key ingredient and flavor in this soup so make sure you pick one you like (or make your own if you’re into that sort of thing.) Adding diced tomatoes, onion, and garlic step it up a notch while the vegetable broth takes it into soup territory. I added a diced red bell pepper as well but that is totally optional. 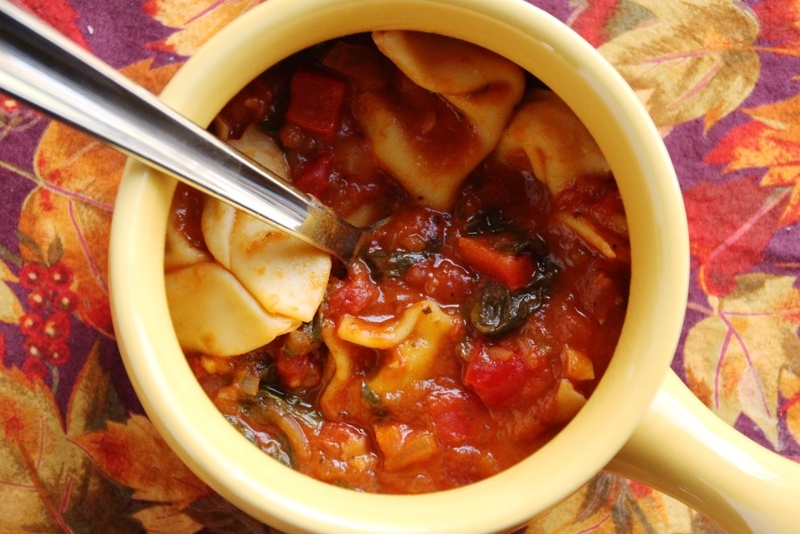 Add several big handfuls of baby spinach and a package of tortellini and you’ve got a quick healthy meal to add to your repertoire. If you’re in need of a nice warm meal, this one is perfect. Serve with a side of bread (like whole wheat beer bread) or grilled cheese sandwiches for an extra hearty meal. It would also be great topped with a little shredded cheese. Over medium heat, heat oil and butter in a large pot until butter is melted. Add onions, garlic, and bell pepper, and cook for a few minutes, or until onions are soft. Increase heat to medium-high and add tomatoes and sauce. Bring to a boil, stirring occasionally. Stir in vegetable broth and return to a boil. Add tortellini and spinach and continue cooking until tortellini is done (check your package instructions), about 10 minutes. 1 The original recipe called for 10 oz of tortellini, but I like a lot of pasta and the package I on hand was 20 oz so that’s what I used. Anything in that range would be great. 2 I buy spinach at Costco in the giant containers so I just added several large handfuls. Add more or less to suit your tastes. 3 It reheats great but it’s definitely thicker the next day (especially if you put in lots of pasta like I did because that is what soaks up the liquid.) If it doesn’t seem soupy enough, add a little water when you microwave it.